CTN is not a patient boy! CTN rarely likes to wait. Yet CTN still loves Waiting Room by Fugazi. If the bass line laid down by Joe Lally in that song doesn’t get your feet moving, you may be clinically dead and just not know it. CTN suggests you get that problem checked out right quick. In fact, CTN loves most anything by Fugazi. If you haven’t checked them out, it is worth your while. Steady Diet of Nothing, the band’s second album, released back in 1991, is probably the best place to start. It is 11 tracks of sonic fury with some pretty provocative messages thrown in. Nice New Outfit, Long Division and Dear Justice Letter will blow you away, both musically and lyrically. And in the musical stream of consciousness that is usually CTN’s brain at work, Waiting Room popped into the old cranium and a smile broke out on the face. Hence, Fugazi gets a little love to start this week’s column. We are really here to talk about the 2010 Winter Olympics. The hockey tournament is less than two years away now and it might just be the last one involving NHL players. CTN is already excited beyond belief about the Olympic hockey tournament. But CTN is also excited about Olympic curling and this summer’s Tour de France. CTN guesses he is just an excitable young boy, to quote the late, great Warren Zevon. And feel free to send in your starting lineups. CTN will publish the best one’s in next week’s Penalty Box. Send your submissions to roarkeblog@nhl.com. Please remember to include your name and hometown. The 2010 Olympic hockey tournament in Vancouver will be a showcase for the best players the NHL has to offer, all playing for pride and their country. The first three Olympic tournaments featuring NHL players have been unforgettable. This edition, in hockey-mad Canada, will trump them all. The possibilities are limitless. While it is too early to pick full rosters for the major teams involved -- so much can happen in two NHL seasons -- it isn’t too early to speculate on the starting six for each country. That is just what CTN plans to do. So “come on and get up,” as Fugazi suggests, and catch Olympic fever this week with CTN. Rick DiPietro has been groomed to be the goaltender for Team USA. The American team will be one in transition. “The Greatest Generation” -- the Guerins, the Modanos, the Chelioses -- are being put out to pasture and “Generation Next” -- the Kanes, the Muellers, the Johnsons (both Jack and Erik) -- are being brought in. But those young players, except for Kane, won’t be ready to take frontline roles in 2010. So the team will be a curious mix of vets and youngsters. DiPietro has been groomed for the starting job ever since he accepted an invitation to be part of the inaugural National Team Developmental Program class. The blue line will be a little spotty, but Rafalski and Martin, occasional partners in New Jersey, are a solid, if physically unintimidating, pairing. Up front, Kane will be able to keep up with the puck-lugging Gomez and Cole will be the prototypical late-arriving winger. God, is this team going to be dangerous. Look at that first line. No, Joe Thornton is not better than Sidney Crosby, but he earns top-line duty because he complements these wingers better. This is a line that can physically dominate other teams and play a cycling game that will be tough to counter. CTN almost left Chris Pronger off the list because of age concerns. But Pronger will only be 35. It’ll be interesting to see if Scott Niedermayer throws his hat in the ring to play for Canada, especially with the tournament being in his back yard. If he does, he likely takes the place of Phaneuf. If not, the young Phaneuf, just 24 come tournament time, takes the next big step in his development. Yes, Brodeur is CTN’s goalie come 2010. He will be 37 at the start of the tournament and still going strong. Roberto Luongo has been Brodeur’s heir apparent for the past six years, but he will have to wait yet some more. This team is just scary offensively. How scary? Ilya Kovalchuk, the No. 2 goal scorer in the NHL this season, and Pavel Datsyuk, the No. 3 assist man, don’t make the top line. Malkin gets the call at center ahead of Datsyuk because he has the build and the straight-ahead game plan to best complement the bullish Ovechkin, who should be the best – and most dynamic -- forward in the tournament. Radulov is not just along for the ride on the top line. He is the perfect left wing for this duo. He has the wheels to keep up with his linemates, has a howitzer of a one-timer and is not afraid to play in traffic and bang bodies a bit. In fact, he is Ovechkin Light at the moment. Markov and Volchenkov on the blue line are the perfect balance of offensive potential and defensive responsibility. Volchenkov will be the perfect insurance policy for the go-forward players all around him. Markov gets the No. 1 pairing nod over Sergei Gonchar just because Markov is a little better in his own zone. Goaltending has usually been Russia’s weakness, but not this time. Nabokov is a solid No. 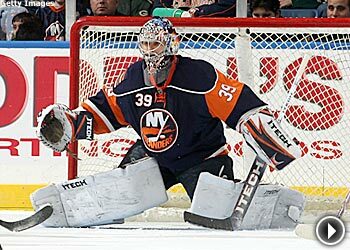 1 and he will be pushed mightily by Ilya Bryzgalov. The defending champs are getting a little long in the tooth, but the vets should have one more kick at the can left in their aging bodies. Yes, Sundin will be pushed hard by Henrik Sedin for the No. 1 center job, but CTN believes that Sundin has two more NHL seasons in him. If he is playing well in the NHL, Sundin gets the nod because of his resume. Alfredsson will be 37 come tournament time, but he shows no sign of slowing down. Plus, Zetterberg is so sublime that he will take at least a few years off both players’ legs. Lidstrom, meanwhile, is ageless, it seems. He will be 39, but he plays like a 29-year-old. Lundqvist is the clear-cut choice in net. Not only is he the best Swedish goalie, but he is the goalie for the gold-medal side, so he gets the nod just out of loyalty and gratitude. That’s not a misprint. CTN is going with Toskala in goal, unseating Miikka Kiprusoff. By the time the Olympic tournament rolls around, Toskala will be in his third season as a starting goalie and will have established himself as a bona fide No. 1. Kiprusoff is a few years older and he has not been as sharp as usual this year, so there has to be some trepidation about his form two years down the road. And the Finns will need a game-breaking goalie because goals will be tough to come by for this club. CTN assumes that Teemu Selanne, who will be 39, will have retired after the 2007-08 season, so he will be out of the mix. That means Lehtinen and Hagman will be the primary options to ride Jokinen’s flanks. Those two Dallas players have a combined 37 goals this season. But CTN absolutely loves the starting pair on defense. Timonen and Lydman are both excellent skaters and puck distributors. Plus, Lydman is underrated in his own end. Remember when the Czechs were the elite team in international hockey, winning Olympic and World Championship titles like it was their birthright? It wasn’t that long ago. But the Czech program has fallen on hard times and it doesn’t appear that the 2010 tournament will signal the start of a turnaround. CTN is assuming that Jaromir Jagr, at 39, will not be in the mix, hence the presence of Hemsky on the right flank. If you think Hemsky isn’t a first-line winger, watch him play for Edmonton. Or better yet, go ask Wayne Gretzky. If Plekanec has another year next year like the one he is having this year, he is without a doubt the Czech’s first-line option in the middle. Elias is getting older, but he should still be in his prime in Vancouver. But, the club lacks depth, especially on the blue line. Plus, its options in goal are limited. Vokoun is a legitimate No. 1, but his ability to carry a weaker, defensively suspect team deep in an elite tournament has to at least be brought into question.